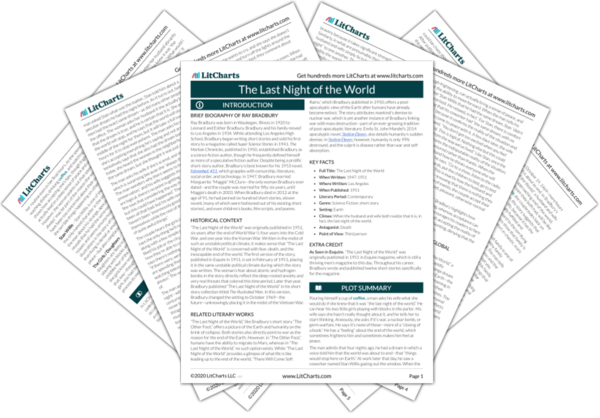 Instant downloads of all 945 LitChart PDFs (including The Last Night of the World). Welcome to the LitCharts study guide on Ray Bradbury's The Last Night of the World. Created by the original team behind SparkNotes, LitCharts are the world's best literature guides. A concise biography of Ray Bradbury plus historical and literary context for The Last Night of the World. A quick-reference summary: The Last Night of the World on a single page. In-depth summary and analysis of every of The Last Night of the World. Visual theme-tracking, too. 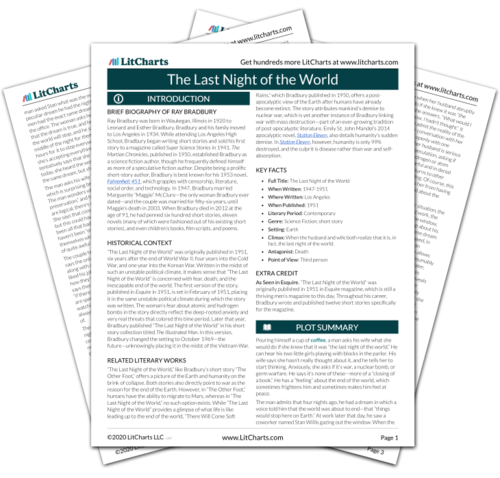 Explanations, analysis, and visualizations of The Last Night of the World's themes. The Last Night of the World's important quotes, sortable by theme, character, or . Description, analysis, and timelines for The Last Night of the World's characters. Explanations of The Last Night of the World's symbols, and tracking of where they appear. An interactive data visualization of The Last Night of the World's plot and themes. Ray Bradbury was born in Waukegan, Illinois in 1920 to Leonard and Esther Bradbury. Bradbury and his family moved to Los Angeles in 1934. While attending Los Angeles High School, Bradbury began writing short stories and sold his first story to a magazine called Super Science Stories in 1941. The Martian Chronicles, published in 1950, established Bradbury as a science fiction author, though he frequently defined himself as more of a speculative fiction author. Despite being a prolific short-story author, Bradbury is best known for his 1953 novel, Fahrenheit 451, which grapples with censorship, literature, social order, and technology. In 1947, Bradbury married Marguerite “Maggie” McClure—the only woman Bradbury ever dated—and the couple was married for fifty-six years, until Maggie’s death in 2003. When Bradbury died in 2012 at the age of 91, he had penned six hundred short stories, eleven novels (many of which were fashioned out of his existing short stories), and even children’s books, film scripts, and poems. 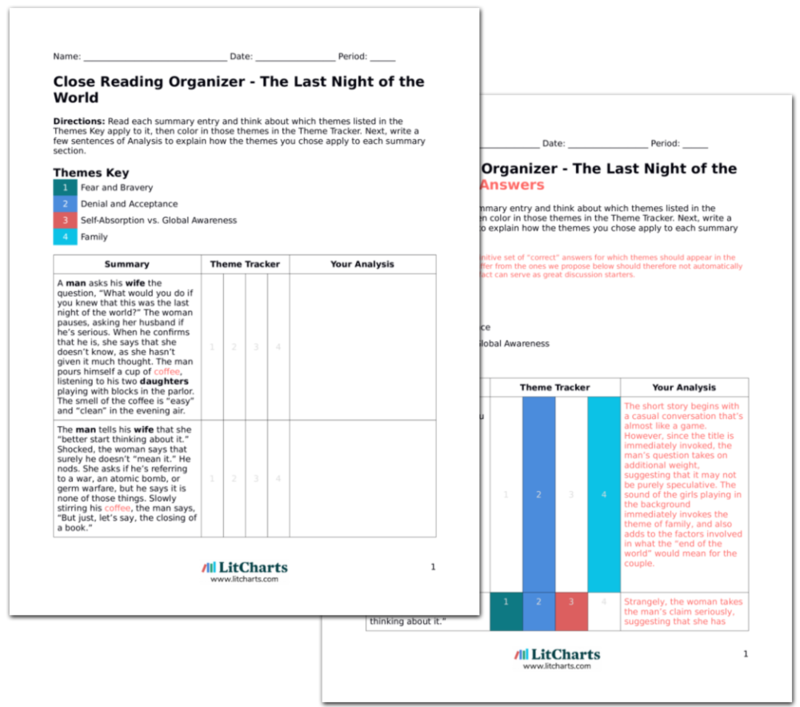 Get the entire The Last Night of the World LitChart as a printable PDF. “The Last Night of the World” was originally published in 1951, six years after the end of World War II, four years into the Cold War, and one year into the Korean War. Written in the midst of such an unstable political climate, it makes sense that “The Last Night of the World” is concerned with fear, death, and the inescapable end of the world. The first version of the story, published in Esquire in 1951, is set in February of 1951, placing it in the same unstable political climate during which the story was written. The woman’s fear about atomic and hydrogen bombs in the story directly reflect the deep-rooted anxiety and very real threats that colored this time period. Later that year, Bradbury published “The Last Night of the World” in his short story collection titled The Illustrated Man. In this version, Bradbury changed the setting to October 1969—the future—unknowingly placing it in the midst of the Vietnam War. “The Last Night of the World,” like Bradbury’s short story “The Other Foot,” offers a picture of the Earth and humanity on the brink of collapse. Both stories also directly point to war as the reason for the end of the Earth. However, in “The Other Foot,” humans have the ability to migrate to Mars, whereas in “The Last Night of the World,” no such option exists. While “The Last Night of the World” provides a glimpse of what life is like leading up to the end of the world, “There Will Come Soft Rains,” which Bradbury published in 1950, offers a post-apocalyptic view of the Earth after humans have already become extinct. The story attributes mankind’s demise to nuclear war, which is yet another instance of Bradbury linking war with mass destruction—part of an ever-growing tradition of post-apocalyptic literature. Emily St. John Mandel’s 2014 apocalyptic novel, Station Eleven, also details humanity’s sudden demise. In Station Eleven, however, humanity is only 99% destroyed, and the culprit is disease rather than war and self-absorption. Climax: When the husband and wife both realize that it is, in fact, the last night of the world. As Seen in Esquire. “The Last Night of the World” was originally published in 1951 in Esquire magazine, which is still a thriving men’s magazine to this day. Throughout his career, Bradbury wrote and published twelve short stories specifically for the magazine. Weeks, Rachel. "The Last Night of the World." LitCharts. LitCharts LLC, 23 Jul 2018. Web. 11 Dec 2018. Weeks, Rachel. "The Last Night of the World." LitCharts LLC, July 23, 2018. Retrieved December 11, 2018. https://www.litcharts.com/lit/the-last-night-of-the-world.